In the continent of Africa was born the human race. Some 60,000 years before period, the humans numbered in hundreds. They moved out from the Rift valley, in Eastern Africa, to gradually populate the whole world. The Y-chromosome gene is passed on from father to son over generations. In very rare cases, random changes, called mutations, would occur in this gene. These (mutations) are in turn inherited from generation to generation without fail and serve as markers for genealogists to determine similar genes. It is again by means of these mutations that different human genes were identified. R1a1, one such gene, is a marker which arose some 10,000 years ago. The ancestors of this gene's carriers moved into and settled down in Western Asia, Eastern Europe, Central Asia and North India in the ancient prehistoric past, ten thousand years ago. They are associated with an early people who probably rode on horseback and who spoke the Proto-Indo-European language, which gave rise to languages like Sanskrit, Persian, Latin and German. The largest concentration of people who carry this gene are found in South Asia, especially in North India, and in South East Europe, especially in Ukraine. Many warriors of the ancient world like the Indo Aryans and the Scythians carried this gene. R1a1 also happens to be my patrilineal gene. This means that my father, my paternal grandfather, my paternal great grandfather, also my father's brothers, my paternal cousin brothers (first, second, third or fourth), my father's paternal cousins, my father's paternal uncles, in fact all the men of the Mookonda family of Kodavas from Bilugunda village near the towns of Ammathi and Virajpet in Kodagu, carry this gene. My earliest genetic ancestor was M168 (the earliest man to have existent descendants, all men today; he was labelled M168 after the gene identifier by scientists) who lived 50,000 years ago and whose people used stone tools and knew cave painting art. Due to drought, he and his people, the ancestors of the Eurasians, moved out of their homeland and traveled north. They followed good weather and the animals that they hunted. Humans of this age became intelligent and knew the use of language. 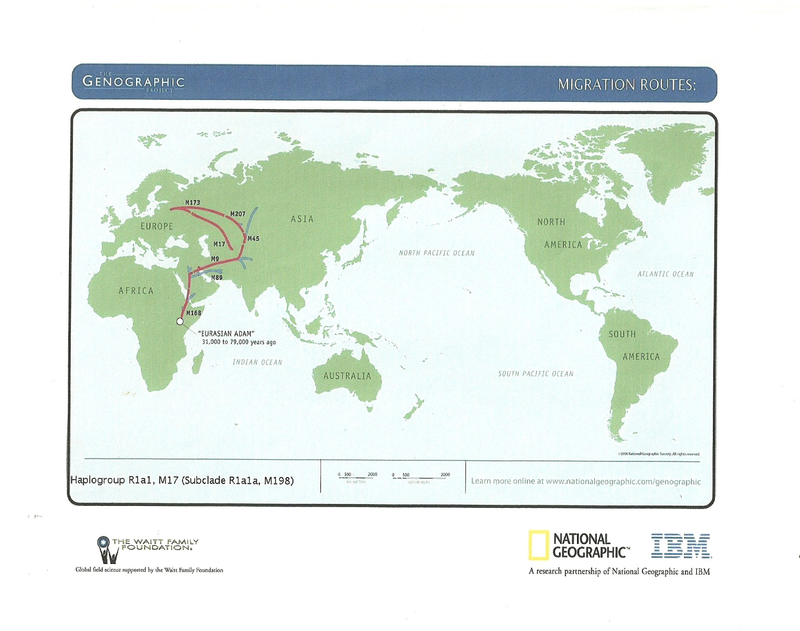 M168's descendant M89 (the ancestor of all ethnic non-Africans) is the next known genetic marker. He was born 45,000 years ago on Semi-arid grass plains and is the ancestor of 90-95 per cent of the non-Africans. His people, the Middle Eastern Clan, moved through the Middle East following herds of wild buffaloes and antelopes. They traveled through Iran into Central Asia. Humans numbered around a mere ten thousand. Some 40,000 years ago M9 was born among his descendants who moved eastward. Their march was blocked by the massive Himalaya Mountains to the Northwest of India. Here in the region called the Pamir knot the people split up and took different directions. A part of this Eurasian clan moved north into the Central Asian Steppes in what is today Kazakhstan, Uzbekistan and Southern Siberia. Here some 35,000 years before period was born M45, the next distinct marker. Over the ages rainfall reduced in the region and so the herds of large game moved north. The seasoned hunters along with M45 followed these herds out of the region. They sewed their animal skin clothes by means of bone needles. They learnt to build makeshift tents of animal-shelters and to make microlithic weapons. M45's descendant M207 began to move out of his ancestor's territory and his descendants split to populate Europe and South Asia. One man born in the M207 clan was M173 who lived around 30,000 years ago. He moved out of the Steppes of Central Asia westwards toward Europe. His descendants settled the fringes of Europe and were more skilled in the use of stone tools and his people used jewellery as well. The humans numbered around a lakh or so at this time worldwide. Some 10,000-15,000 years ago M17 was born in the M173 clan. The human population worldwide rose to a few million during this period. The people of the M17 (also called R1a1) clan gave rise to the Indo-European languages as these people spread so did their languages. The Kurgans of southern Russia and Ukraine were nomadic horsemen who were the first known people to speak an Indo-European language and to carry the M17 (R1a1) gene. Ancient Warriors like the Scythians carried this gene. Indo-European speakers moved across Eurasia, they moved into North India on one side and Europe on the other. Some five to ten per cent of the Western Asians carry this M17 gene. Forty per cent of the people of the Steppes, thirty five per cent of Farsi (Persian) speaking Eastern Iranians and thirty five per cent of the Hindi-speaking North Indians carry this gene as well. 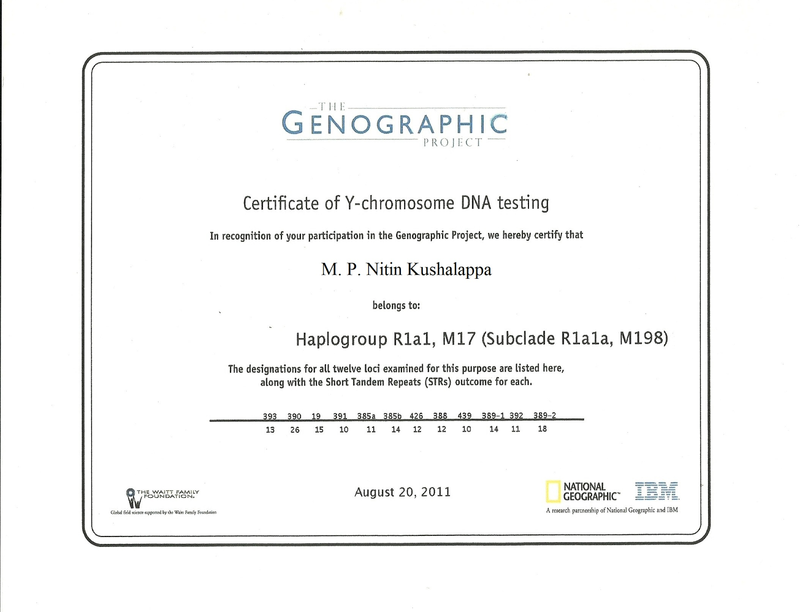 Only ten per cent of the Dravidian speakers carry the M17 gene. Here the genetic trail ends. Nothing else can be determined from the gene about what happened to the people in the last 10,000 years. So if all the human race originated in Africa, some 60,000 years ago, all the other regions of the world were only populated later. I hope that many more people would participate in this project and contribute towards this research. It helps understand the unknown histories of the human race as told by genealogists This project proves that all humans are of common origin despite their different ethnic backgrounds. I hope more people participate in the Nat Geo project to throw more light on the subject.